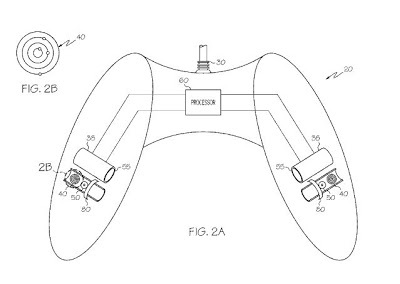 The ‘901 patent describes a game system where a player puts on a headset which measures his bio-feedback and displays it for him to see. The headset is designed to measure participant physiological data and incorporate it in real-time into the game. The headset includes a galvanometer which measures skin resistance, an ear piece which transmits audio from the game to the participant, and a microphone which allows verbal communication from the participant. The headset itself is electronically coupled with the handheld video game system. It’s an interesting concept, certainly something Stanley Kubrick would be proud of. A video game system using one or more bio-feedback devices for the monitor and transmission of physiological data of a participant of the video game system to the video game system where the data, along with conventional controller data is incorporated into game play provided by software through the video game system. A headset electrically coupled to a video game system, the headset including one or more bio-feedback devices for transmitting participant physiological data to the video game system for real-time incorporation into game play. 1. A headset for use with a video game system, the headset comprising: a first bio-feedback device for transmitting to a video game system physiological data of a participant thereof comprising a respiratory voice sensor, wherein the respiratory voice sensor comprises a thermocouple; one or more second bio-feedback devices for transmitting to a video game system physiological data of a participant thereof, wherein the one or more second bio-feedback devices comprise at least one of an electroencephalogram electrode or a galvanometer; a communication link for electrically coupling the headset and the video game system; and conductive wiring for electrically coupling the first and second bio-feedback devices with the communication link.